Do you weld professionally or at home? Then you will need a welding helmet. 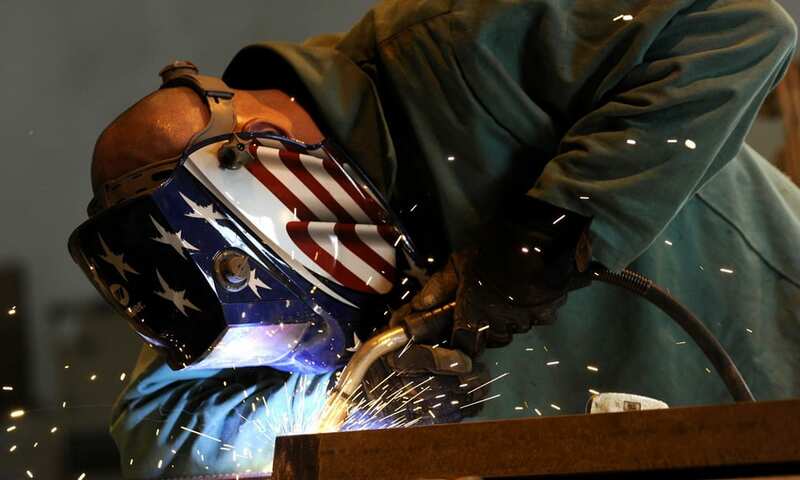 These helmets protect your face against the extreme heat and flying sparks of welding and plasma cutting machines and also protect your eyes against the bright lights. Technology has come a long way over the past few decades, and the range of helmets available spans from solar-powered auto-adjusting helmets to basic, single setting helmets. You may be interested in: Best MIG Welders. 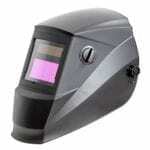 View the Best Welding Helmet for the Money, Below. How to use a Welding Helmet? How to Change a Battery in a Welding Helmet? All of this choice can seem overwhelming, but luckily we have done some of the basic research for you. We consulted experts, bloggers and customer reviews to bring you this list of the top 10 welding helmets you can currently buy online. If you are simply looking for an entry level welding helmet, this is a great option thanks to the reasonable price and range of features. It has been awarded Amazon's Choice for welding helmets thanks to excellent customer reviews and great sales levels. The shade variable ranges for most welding and plasma cutting procedures, especially for beginners to welding. It has modes which can be switched depending on what task is being performed - TIG, MIG, MMA, plasma, and grinding. It comes with extra lens covers to ensure it will last for a long time. The viewer is a reasonably good size for the price point at 3.86 inches by 1.73 inches. There are a number of different sensors included helping give you a better idea of what is going on when you are welding. It is solar powered, which will save you money in the long run on battery costs and is also much better for the environment. See more information on Antra AH6-260-0000 Helmet. You don’t want to spend too much if you are only new to welding, and this helmet is a perfect way to get all of the necessary features without having to splash out on a tonne of extras. The Jackson Safety helmet has auto-darkening technology which means it reacts to the level of light being emitted to give optimum protection to your sight as well as allow you to see much as possible. It has been given a full 1/1/1/1 rating from EN379, meaning you cannot get any better than this in terms of protection. This is a very high-quality helmet if you are looking to upgrade and work in a more professional environment with welding materials. The plastic is lightweight, meaning it will feel comfortable on your head. It is also high density to ensure the helmet is durable and provides maximum protection. It is adjustable, so will fit comfortably on most head sizes and is even compatible with hard hats if you are working in an area where these are also required. The front of the helmet is aerodynamically designed to ensure the risk of heat build-up is reduced - further enhancing comfort and safety. See more information on Jackson Safety Auto Darkening 46157. This helmet is on the much pricier end of welding helmets, but it is absolutely essential to invest in a good helmet if you are welding in a more serious capacity. This has everything you could possibly want in a helmet, and the best safety rating possible. By far the cheapest helmet on this list, if you are looking for an introductory helmet with no frills, this is the one! As the name suggests, the front of the helmet flips up and down which allows you to remove it as soon as possible once you have finished welding. It is fully approved by the ANSI, so is safe to use in most minor welding activities. The viewing area is 4.5 inches by 2 inches, which though quite small is more than adequate for infrequent use. If you only need it for the occasional task here and there, you really do not need to invest in an expensive helmet. This is very safe for use and covers all of the most essential bases for welding helmets by protecting your sight and your face. The fit is adjustable so it will sit comfortably on most head sizes. There are ten variable shades available, however, you will need to adjust these yourself. See more information on Hobart 770286 Flip Front Helmet. This is the best option if you are looking for something cheap but effective for small tasks that do not take a lot of time. Keep in mind you need to adjust the shade yourself, however, a short guide assists you to know roughly which settings are best. Lincoln Electric is a very trusted brand when it comes to tools and accessories, and this is yet another excellent item to add to their range. This helmet utilizes brand new 4C technology to improve what you are able to see whilst still providing maximum protection against sight damage. At only 3.2 pounds it is quite light for a welding helmet and very easy to carry. It is solar powered, which is great for the environment and saves you additional costs for batteries in the future. Extra lenses are included to help you adjust to your own welding needs - meaning it can be used both inside and outside regardless of the lighting conditions. A stylish carry bag is included, as well as a bandana which you can wear under the helmet to catch any sweat and protect the interior of the helmet. See more information on Lincoln Electric 3350 Series. This helmet uses modern technology very well to help you see more of what you are welding whilst you are wearing the helmet. Though it is definitely on the pricey end, it is still much cheaper and more cost-effective than other premium helmets and is a great upgrade choice. If you are on a budget but willing to spend a little bit more for a wider view, this is an excellent choice. It comes with 3.62 inches by 1.65 inches viewing area - a standard on some of the more expensive helmets. It requires manual adjustment, but this is easily done with a slider on the side of the helmet. It also comes in a funky skull and flames design, allowing you to look stylish while you weld. The filter has an auto-darkening mode, which is solar powered for easier use and increased environmental friendliness. If you are not keen on the regular design, they also have a plain black helmet. The weight of the helmet is balanced so it will fit comfortably on your head whilst causing minimal strain, and the plastic is lightweight despite being so sturdy. See more information on DEKOPRO DP-33 Wide Lens Helmet. Of the budget helmet options, this one just shows you that sometimes a few extra dollars can buy you a lot more. Unique design aside, this has great automatic features and is solar powered, making it convenient as well as safe. If you are looking for a starter helmet we highly recommend this. Jackson Safety is a trusted brand when it comes to personal protective equipment (PPE) such as welding helmets. This is a great helmet for professionals who are looking to upgrade to something that protects against those tougher, longer tasks. This has an auto-darkening setting which means it will automatically adjust to the best setting to protect your eyes, whilst still allowing you to view the object you are welding in detail. It also comes with cool stars and stripes design - excellent if you are feeling a little bit patriotic or even if you are just a bit of a Captain America fan. It is super comfortable to use, with many customer reviews praising how great this felt on their head compared to other, bulkier welding helmets. It comes in at a reasonably moderate price point, so is fantastic if you want to upgrade without completely going overboard with your budget. See more information on Jackson Safety Auto Darkening 46101. This comes in a cool, and much more subtle, design that is great if you want to show off your personality without going over the top like some of the brighter helmets. It is very comfortable to use, and a fantastic upgrade if you are someone who wields a lot more often than you used to. This welding helmet comes in a completely different design from classic welding helmets. This means it is a very comfortable choice, and the aerodynamic design allows it to feel lightweight and well balanced on the head. It uses resistance nylon, which provides ultimate protection against high impact objects, adding an additional layer of protection to the helmet. The viewing window is also much larger than other helmets, so great if you need unrestricted peripheral vision. The screen has an auto-darkening mode, which allows the helmet to adjust to the lighting conditions for ultimate protection and ease of use. The control panel uses a touch screen which gives it a very futuristic feel and again makes it much easier to use than clunkier models. It requires two batteries, thought the first set are included. Customers love how this feels when worn, as well as the durability of this particular helmet. See more information on Esab SENTINEL A50 Welding Helmet. This is a very modern take on the welding helmet, combining easy use with comfort to give an all-around great product. If you are looking to upgrade, this will be a fantastic piece of kit to make welding more comfortable and give you the ultimate safety. Another great product from DEKOPRO, this also comes with a cool design - this time in the form of a bald eagle and the stars and stripes herself. This is truly a fantastic option if you are feeling a little patriotic and want to display this whilst welding. It has been awarded Amazon's Choice for auto-darkening welding helmets, thanks to its excellent auto darkening qualities and very good customer reviews. The standard viewing area allows you to see in a number of different angles, improving your peripheral vision whilst using a welding helmet. It comes recommended by a variety of industries - including automobile mechanics and hospitality workers. The low price point makes it excellent if you are on a budget, but wish to retain all the cool features of some of the pricier options. If you are not keen on the bald eagle design, it also comes in plain black or black with a red stripe. See more information on DEKOPRO XG9 Solar Powered Mask. DEKOPRO is one of the best companies if you are looking for budget-friendly PPE. This helmet has all of the most important features, as well as some of the thrills, at an only slightly more expensive price than other options. Though double the price of the budget options, this helmet is still considerably cheaper than some of the most expensive helmets yet still retains excellent quality and features. It comes with a 1/1/1/1 optical class rating, assuring you that it has the best safety rating possible for a welding helmet. There is a wide range of shades available, allowing you to use this as a good all-rounder helmet for most welding and plasma cutting tasks. The large view area gives you improved sight over the objects you are welding and allows you to look from all angles. TACKLIFE are so confident in the quality of this helmet that they provide a 24-month warranty with every purchase - one of the only companies to do so with their welding helmets. There are six additional lenses included, allowing you to adjust the helmet to your needs, and a simple storage bag for keeping the helmet safe from dust and debris. The auto darkening feature has one of the fastest responding darkening times of all the helmets, increasing the safety of use. See more information on TACKLIFE PAH03DWH Pro Welding Mask. As always, any warranty period is much appreciated when purchasing an item - especially PPE and tools. This helmet could easily compete with some of the more expensive options on this list and is, therefore, a great option if you are happy to expand your budget a little. This is another mid-priced item that nevertheless delivers the same quality as some of the more expensive helmets. Made by DEKOPRO, it is a very high-quality item that has been specially produced to be one of the best helmets on the market. It has an auto darkening feature that works within 1/25000 of a second, making it very safe to use. This function is powered by a solar powered battery, making it environmentally friendly and saving you battery costs. The viewing area, as with all DEKOPRO welding masks, is standard in size but designed to allow you to view in various angles - improving your peripheral vision whilst using a welding mask. When fully charged, the mask will last up to 5000 hours - so will only need to be recharged in sunlight every so often. It comes in a cool design that can be purchased in either red or blue and is much less in your face than some of the other designs. See more information on DEKOPRO XG30 Welder Mask. Though the priciest DEKOPRO product on this list, we recommend this as their best helmet due to the full range of features. It also has some fantastic customer reviews, confirming how good quality this is for a mid-range welding helmet. The whole point of wearing a welding helmet is to improve your safety while using a MIG or TIG welder on a bench vise, so it, of course, makes sense to double check the helmet is safe itself. Check customer reviews to get a good idea of how well the helmet holds up after frequent use. You want it to at least be lasting a few years. In terms of EN379 ratings, always look for helmets that have the 1/1/1/1 rating. There is a complicated explanation of what this means, but in short, it is the four points where welding helmet safety is measured. One is the highest score and three is the lowest. Always, where possible, aim for that 1/1/1/1 rating – even if it costs a little bit extra. If the helmet is manufactured in the US, Canada, EU or Australia, it will definitely conform to (or even exceed) American manufacturing and safety standards. Outside of these areas the rules can be more relaxed, so again in this situation, we would suggest taking a more thorough look at the customer reviews. Related: Best Soldering Irons in Review. You can get two different light settings with a welding helmet – either manual or automatic adjusting. Automatic adjusting is handier, but manual adjusting gives you more freedom for your own preferences. Always check the darkening range of each helmet – the bigger the difference between the highest and lowest, the better. Finally, if at all possible get a helmet with a warranty. This means that you will be protected against unnecessary damages to the helmet within the warranty period. It also shows that the manufacturer cares about the quality of the item and believes it will be long-lasting. 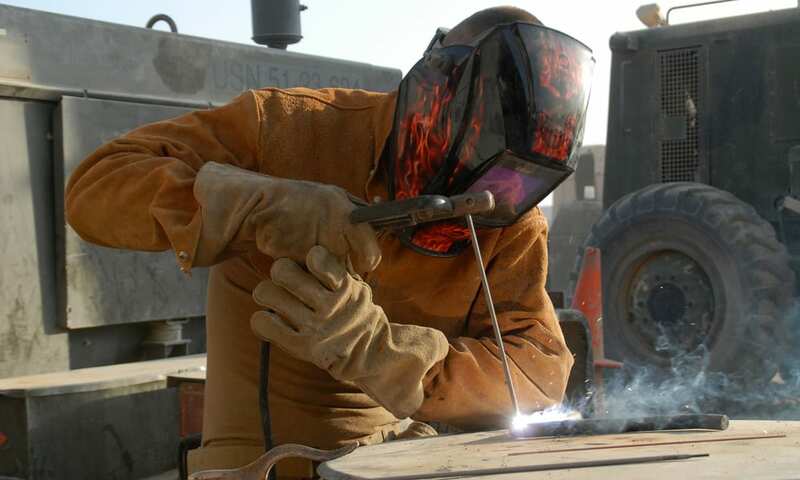 For a basic, single setting welding helmet you simply need to place the headband around your head and lower the mask. This will effectively protect your face and your eyesight, but many of the more modern masks have additional features. For a self-adjusting darkness helmet, there will likely be a knob on the side of the mask that you can turn. Keep turning until it is at the preferred darkness level. We suggest keeping it at the maximum darkness you are able to cope with for maximum protection. Auto-adjusting helmets will do this for you – but you should make sure you set the delay time. This is based on your personal comfort, but where possible try to make this delay time as short as possible. Otherwise, most helmets are self-explanatory. We suggest wearing a bandana underneath to help fleck away sweat from your hair and forehead. This will make welding just that little bit less uncomfortable. In helmets that do not charge using a solar panel, this will be fairly straightforward. There will be a clear place marked for inserting batteries, usually with a battery cover or a stand outbox. Simply replace the batteries here as you would with any other electronics. For solar powered helmets it might seem like you do not have to change the batteries, but if you are noticing low performance this can help. All you need to do is located the solar panel and cut underneath it to reveal the battery. You can then replace the battery and solar panel with a hot glue gun. If you are unsure about your ability to do this, take it to a professional. Nevertheless, this often solves a lot of problems people have with welding helmets that require batteries. The wide range of welding helmets currently on the market can make finding the perfect one seems a lot more challenging than it is. You need to consider your own needs and preferences, alongside the safety and the durability of the helmet, and then we are sure you will find the right one. We always suggest prioritizing safety and durability over anything else, but in the case of welding helmets, you should also make sure it is an effective tool. Trusted companies are always a great option, and customer reviews are your friend for making sure everything is as it should be. Once you’ve taken all this information into account, you can also consider the design of the helmet and find something that reflects your personality. The options truly are endless, but we hope this list helps you narrow them down. If a helmet has been given a 1/1/1/1 rating, then it has been awarded the best possible score in terms of protection against bright lights. These helmets are always the best helmets, and it’s important to understand this. 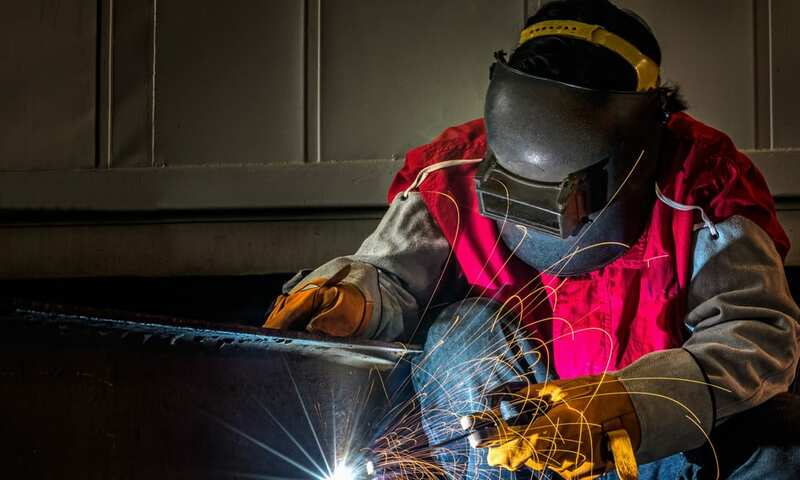 We hope you enjoyed our article on "10 Best Welding Helmets in 2019", if so, please share and rate it.